Walking near the top of Merchants Street, in Valletta, on a Sunday morning one is bound to be drawn to St Catherine of Italy church by the sound of voices singing in unison. Many stop to watch and listen. The Ethiopian and Eritrean Orthodox Tewahedo congregation claps as it sings, bodies swaying and arms raised in praise of the Lord. Those who enter remove their shoes, kneel, make the sign of the cross and bow in worship, before sitting. Song dominates the two-and-half-hour long service during which it is evident the participants are enjoying the ceremony. When the service comes to an end, the congregation stands and forms a line going up to a makeshift altar where each kisses, kneels and prays in front of a number of framed holy images before going on to a priest holding a Coptic across which they kiss before the priest touches their forehead with it. The congregation is made up of illegal immigrants who, on being released from detention, asked the director of the Emigrants Commission, Mgr Philip Calleja, for a place of worship where they could celebrate Sunday Mass. Eritrean Manuel Fissanaye said that, initially, arrangements were made for them to use the Greek church, in Valletta. This was about a year ago when the congregation numbered 26. But after about three months, the congregation grew to over 200 and Mgr Calleja's assistance was sought once more for a bigger place to be provided. The Coptic Orthodox have since been meeting at St Catherine of Italy church every Sunday at 8 a.m. The service is partly in Ethiopian and partly in Eritrean. Although war rages between the two countries, the Ethiopians and Eritreans here are friends and blame the war on their governments. "We have the same skin colour, the same culture, the same religion, we have intermarriages - we are one people," Mr Fissanaye said, adding that the service was carried out in both languages so that everyone would feel included and able to take part. Asked about his problems in Malta, away from family and friends, Mr Fissanaye said he left his home country after graduating from university in search of a better life to support his family. He ended up here working as a labourer, unable to make use of his academic training. "But everyone has problems. It is useless complaining and saying I have a problem. I accepted the situation and adapted to it." His Ethiopian friend, Ashenafi Bulto said that sometimes people found it difficult to understand that everyone was a person, irrespective of one's skin colour and origins and should be respected as such. The Orthodox Tewahedo Church belongs to the Oriental Orthodox family of churches. The Coptic Church, which has been a distinct church body since the Council of Chalcedon in 451 AD, regards itself as a strong defendant of Christian faith. Daily, in all Coptic Churches around the world, Copts pray for the reunion of all Christian Churches. They pray for world peace and the well-being of the human race. While the roots of the Church are based in Egypt, it has a worldwide following. Is the Christian West Serving Christianity or Islam? I am always puzzled why wastern Christian governments are working against their faith and facilitate, one way or the other, the Dechristianization of different parts of the world. The predominantly Christian Europe is very much tolerant of devil worshipers, Muslims, atheists etc whereas, Christian values are looked down upon. A Swed preacher was once taken to court for opposing homosexuality. Islam on the other hand is publicly brainwashing youngsters in schools, even in the heart of Europe-Germany, teaching them killing infidels is the right thing to do, holy. Rouged governments like Iran school curriculum openly sites the elimination of Israel and infidel Christians. It is no different in the case of other Arab countries. Saudi Arabia, the best US partner and exporter of Wahhabi fanatic Islam, such as to Ethiopia, is itself the core of world terrorist factory. The same is true with Christianity in Iraq. A christian country is controlling the country, but never seen in their long history, Iraqi christians are fast vanishing by terrorist Islam. Read this commentary from The Washington Times entitled "End of Iraq's Christian Community?" CAIRO, Jul 24 (IPS) - A recent statement by Pope Benedict XVI in which he declared the Roman Catholic Church to be the only "complete" Christian faith met with angry responses from the heads of several western, Protestant denominations. In Egypt, meanwhile, Benedict's assertion about Eastern Orthodox churches -- that they "lacked something" in their capacities as churches -- prompted no less of an angry reaction from the Orthodox Coptic Christian community. "It's the Vatican's right as a religious institution to establish its own internal doctrines particular to itself," Youssef Sidhoum, editor-in-chief of independent Coptic weekly al-Watani told IPS. "But it doesn't have the right to issue statements passing judgment on other churches." On Jul. 10, in an official document approved by the Pope, the Vatican declared that the Catholic Church was the only church to contain "all the elements that Christ himself instituted." The proclamation went on to assert that Protestant Christian denominations were not "churches" in the full sense of the word, while non-Catholic orthodox churches suffered from certain imperfections. According to the document Protestant denominations, which split from Rome in the 16th century, should be viewed as Christian "communities". As for churches of the Eastern Orthodox rite, the papal statement conceded that they do constitute proper churches, having been established on the basis of apostolic succession (meaning they were founded and maintained by Christ's original apostles and their successors). Nevertheless, the statement went on to note that these churches "lack something" for not recognising the primacy of the Pope. Despite these assertions, the document went on to stress the Vatican's continued commitment to ecumenical dialogue with leaders of other Christian denominations. Salib Meta, member of Egypt's Coptic Christian Religious Council, riposted by saying that it was the Eastern Orthodox rite that represented Christ's original church. "The Catholic Church is the one that...deviated from the true faith, which is represented by the Orthodox Church," he stated in a Jul. 11 interview on Arabic-language internet news service Alarabiya.net. The Coptic Church, members of which represent an estimated 10 percent of Egypt's 75 million-strong population, split with the Catholic Church in the fifth century over differing views on the nature of Christ. In an effort to soothe outraged Coptic sentiment, the Egyptian Catholic Council issued a statement Jul. 11 explaining that the Vatican's assertion had only "pertained to the rites of the western church." The statement went on to stress the Catholic Church's "respect and appreciation" for all Christian churches outside the Catholic fold. But the clarification was not enough to placate discernible displeasure on the part of the Coptic leadership. In a Jul. 14 interview, head of the Coptic Church Pope Shenouda III criticised his Catholic counterpart, saying that Pope Benedict appeared to be "making enemies all the time." Speaking to flagship government daily al-Ahram, Shenouda said that Benedict, in only two years as Pope, had already managed "to alienate all the Muslims." The reference was to Benedict's declaration in August of last year, in which he stated that Islam was "a religion of violence, spread by the sword." 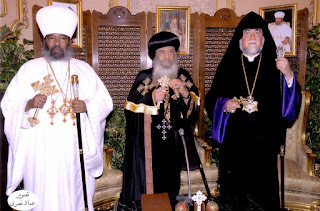 Assistant Catholic Patriarch in Egypt Father Boutros Fahim declined to comment on Shenouda's remarks. "It's better not to reply," he was quoted as saying in the Jul. 15 edition of independent daily al-Masry al-Youm. "To quarrel is not among the traits of the Catholic Church, which has already issued a statement reiterating its respect for all Christian churches." But despite the uproar over the latest Vatican statement, the assertions made therein are hardly new to the Catholic Church. A declaration issued in 2000 by the Vatican's Congregation for the Doctrine of the Faith -- headed at the time by the current Pope -- actually made many of the same claims. "What was said in the document was not new to Benedict," acknowledged Shenouda, "but rather a repetition of an earlier document called 'Dominus Iesus', issued in 2000." According to Sidhoum, however, the recent declaration was not itself as important as the person who made it. "When those earlier statements were made in 2000, they didn't lead to a media uproar or have a negative effect on the relationships between churches," he said. "That was because John Paul II was still pope." "But while John Paul II spread a message of peace and understanding, Benedict has issued a document promoting conflict and intolerance between churches," Sidhoum added. "The document essentially represents a relapse in terms of Catholic thinking." Only four days after the controversial Vatican statement, Egypt's Coptic Church held a reception in Cairo under the provocative slogan "The Coptic Orthodox Church is the only Christian Church". The event was organised to commemorate the reactivation of the church's official relations with the Ethiopian Orthodox Church, frozen since 1994. Sidhoum, however, criticised the church's choice of words, which he viewed as another unnecessary provocation.
. "Thanks" to these communists-turned-globalization-advocate tyrants.
. "Thanks" to the "religious fathers" who forgot their God given reconciliation mission.
."Thanks" to these war mongering diaspora-Starbucks-stationed-DC-politicians. As the country prepares to celebrate its Julian calendar's second millennium, critics say the government is using the year-long festivities to divert attention from its dismal performance. The millennium is unique to Ethiopia, the only African county that did not experience colonialism. 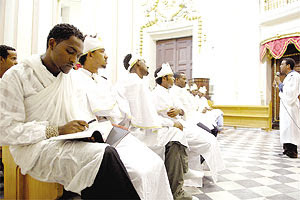 With its unique cultural traditions dating back to ancient times, the Ethiopian millennium is one of the traditions that have passed down from generation to generation without interruption. The organisers of the celebration believe that it will be a chance to change the image of Ethiopia and show that the country has more to offer the world than the images of misery that were splashed across the world following the 1984 famine. IT WILL BE AN OPPORTUNITY TO show the world its rich cultural heritage and tourist attractions — such as the 17th century Fasilidas Castle in Gondar, the famous Obelix of Axum, which was recently returned from Italy, and the rock churches of Lasta Lalibela. Government officials say Ethiopia has survived many phases — from its ancient civilisation to the present economic and social challenges — with its pride intact. Ethiopia has culture and traditions that date back more than 3,000 years, and any traveller is transported through breathtaking monuments and ruins that were built centuries ago. The ancient northern city of Axum remains the country’s oldest urban and religious centre. The Axumite kingdom was once the most powerful Red Sea state between the eastern Roman empire and Persia. Axum hosts the famous monolithic Obelisk, and has been declared a World Heritage Site by Unesco. Gondar, founded in 1636, is known for its castle-like palaces and was Ethiopia’s capital until the reign of emperor Tewodros II. Thus, the concluding millennium has seen Ethiopia prosper and decline both politically and economically. The new millennium, on the other hand, gives Ethiopia a chance to reflect on the past and an incentive to move forward with fresh vigour. In Kenya, several activities to celebrate the millennium are under way. They include a procession and parade through the streets of Nairobi, sporting activities, an exhibition of Ethiopian and African traditional artefacts, a gala night to showcase traditional foods, songs and dances of Africa, presentations by scholars on Ethiopia-Kenya relations, Ethiopian history and other related topics. Ethiopia inspired the world as one of the pioneers of civilisation, not to mention its reputation as the cradle of mankind. Under former Emperor Haile Selassie, Ethiopia was one of the founder members of the defunct Organisation of African Unity. But there were times, too, when its eminence hit rock bottom; times when Ethiopia unwillingly developed notoriety for being a land of despondency, especially during the widespread famine of 1984. But Ethiopians love their unique heritage, including the way they have subdivided the solar cycle into 13 months — a feature used to market Ethiopia as a country with 13 months of sunshine. This time, it will be an Enkutatash (new year) with a difference, since the millennium comes only once in a thousand years. The beginning of the new millennium gives Ethiopians an unparalleled opportunity for renewal of their faith in themselves. Ethiopians from all walks of life will be asking tough questions on why their country has declined to the current state. A recent World Economic Forum report indicates that Ethiopia has slid to the rank of 120th out of 125 countries in 2006 in the Global Competitive Index, down from the 116th place it occupied in 2005. THERE IS ALSO CONCERN whether Ethiopia will meet the Millennium Development Goals by 2015. Economic analysts point out that the number of Ethiopians living on less than a dollar a day, has nearly tripled since Zenawi took power in 1991. Still, the Ethiopian Julian calendar remains unique. The calendars of the entire world are based on the work of the old Egyptian astronomers who, 3,000-4,000 years BC, calculated that the solar or sidereal year lasted slightly less than 365 ¼ days. However, it was left to the astronomers of the Alexandrian school to incorporate this knowledge into some sort of a calendar; it was these astronomers who also came up with the idea of leap years. Subsequently, the Romans under Julius Caesar borrowed their reformed calendar from Alexandrian science and adopted it for the Western world. The Coptics later inherited this science as a right and built upon it themselves. In due course, the Coptics handed this calendar, together with their method of computing the date for Easter, on to the Church in Ethiopia. The Ethiopian calendar retains the old Egyptian system, whereby the year was divided into 12 months of thirty days each plus one additional month of five days (six days in leap years). Ethiopian dates, therefore, fall 7-8 years behind Western dates and have done so since early Christian times. This discrepancy results from differences between the Ethiopian Orthodox Church and the Roman Catholic Church. Each Ethiopian year is dedicated to one of the four evangelists — Matthew, Mark, Luke and John. The year of St Luke is a leap year and, therefore, always has six days in the 13th month of the Ethiopian calendar.